Relegation rundown – who will drop? Whilst there is a massive amount of media attention as to how this could be the closest title race in Premier League history, the fight to stay up could be just the same. This is how the bottom of the table stands as of Friday 7th February with five points separating rock-bottom Fulham from Swansea in 12th. Here is a club-by-club evaluation of how I think the positioning of these teams will play out over the final third of the season. Since winning the Carling Cup in 2013 the stylish Welsh club’s league form has been poor to say the least. This can be put down to a variety of features, players relaxing after winning a trophy, injury hitting their stay player Michu and also fatigue from their efforts in the Europa League this season. All of this has led to the sacking of their charismatic manager Michael Laudrup. They have only collected four points from their last eight league games and that is certainly relegation form. However I feel that, although it is a major cliché, ‘this squad is too good to go down’. I believe they will stay up purely because there are three worse teams in the league. Hull City’s season has been dominated in the news by their owner’s misguided attempts to change the name of the club to Hull City Tigers and the responding backlash from the fans. However on the pitch things have been going fairly well. Hull are getting positive results against most of the teams around them and have the eighth best defence in the Premier League which is massively impressive for a promoted team. They have spent money in January on Nikica Jelavic and Shane Long who, when given time, I believe will be good signings for Steve Bruce. This season began with Paolo Di Canio running Sunderland like a crazy dictator. There was massive dressing room unrest and the players simply hated him. Gus Poyet has come into a club in free-fall and has got them playing some great football and given their fans some hope in the process. Sunderland were bottom at Christmas but have now won three of their last four league games including a 3-0 away derby win at St James’ Park. The form of Adam Johnson along with senior players like O’Shea and Wes Brown are key to them surviving and it would be helpful if Lee Clattermole, ermmm I mean Cattermole, would stop getting red cards. Norwich City fans are deeply worried and rightly so, their form is poor and the team look like one of the weakest in the league. They spent big money in the summer on Gary Hooper and Ricky Van Wolfswinkel, but Hooper has been average with seven league goals (the club’s top scorer) and Van Wolfswinkel has been a massive flop scoring one league goal in fifteen games, which is abysmal. Norwich have a decent defence but are not scoring enough goals and aren’t picking up points. They have won once in the league since December 7th and supporters are turning on manager Chris Hughton. Unless Hooper hits form and goes on a goalscoring run, they’ll be relegated. West Brom made the brave decision a month ago to sack manager Steve Clarke and replace him with Pepe Mel who has no experience of English football. It is yet to be seen what effect this will have and whether the gamble will pay off. They earned a somewhat fortunate point at home to Liverpool but have only won once in their last five games. West Brom have won the least games of any team in the Premier League – four wins in 24 games would usually see them bottom, but they have amassed eleven draws. In my opinion they have the strongest squad out of all of the contenders covered in this article. They are clearly missing last season’s talismanic striker Romelu Lukaku as they tried to replace him with Vydra, Anelka and Anichebe, none of whom have massively shone. I feel the quality of their squad, particularly in midfield, will be enough for the Albion to finish comfortably. For the first half of the season Crystal Palace were a poor excuse for a top-flight team and looked destined to be rock-bottom of the league, they were embarrassingly bad. However I think appointing Tony Pulis was one of the smartest decisions made by any chairman in the league this season and it cannot be over-stated just what an impact this has had on their fortunes. Palace have gone from having the worst defence in the league to having the 11th best. They are doing exactly what they need to do – making themselves tough to beat and nicking three points whenever they can. 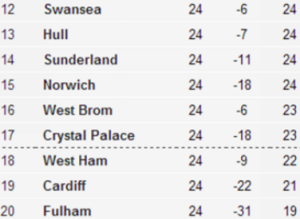 Miles Jedinak, Marouane Chamakh and Joel Ward in particular have impressed as they climb out of the relegation zone. They made a flurry of signings on deadline day beating a number of other clubs to Tom Ince and signing Scott Dann, which is a major boost. I think their squad is still probably the worst in terms of quality in the league but they are organised and hard-working enough to stay up. West Ham have bucked the trend of modern football clubs and stood by their manager even after a set of results which not only angered supporters but embarrassed them. They do not play nice football but do seem to get results when they really need them. The fitness of Andy Carroll is tantamount to the Hammers chances of staying in the Premier League as they are seriously lacking in depth. Sam Allardyce also needs to crack down on some of his player’s discipline as his club are joint worst in the league with five red cards so far this season. This problem is typified by the fact that club captain Kevin Nolan has the worst discipline of any player this season with five yellow and two red cards. What a role model. I can see West Ham staying up by the skin of their teeth and us having to endure another season of 19th century football. Cardiff City are another one of those clubs who decided to ditch their manager half way through the season, however that is just the surface of what happened there. Owner Vincent Tan has alienated fans and put Ole Gunnar Solskjaer at the helm in a massively pressurised situation. Cardiff are sitting in 19th and have only won five league games all season. Their squad is weak. They have made a great move by signing Wilfried Zaha on loan from Manchester United, however I just feel that they do not have a side that will be able to put together a good enough run to stay up. Fulham are a shambles, I don’t know how else to put it. They are sat at the bottom of the league and four points from safety for a number of reasons. There are problems in each department of the team. The defence is leaking goals all over the place with John Arne Riise and even the previously solid Brede Hangeland looking out of their depth. They have conceded by far the most goals in the league and so have the worst goal difference in the league. Their midfield is lacking in creativity and real quality with lots of hard-workers but no real flair. Their strikers have been hit and miss with Berbatov wanting out of the club since early on in the season. Fulham have pinned all of their hopes on big money signing Konstantinos Mitroglou from Olympiakos, which is a huge gamble. Even though I feel he is a very good signing, Fulham are a club in disarray and are doomed for the Championship. So that’s Norwich, Cardiff and Fulham to go. Do you agree with me? Next: Next post: Jese – another Real diamond to lose? I’m a Fulham fan and sadly I agree with you, although I’d be more inclined to replace Cardiff with Sunderland as I think Sunderland’s form will dip again soon. As for my team Fulham; we’re terrible. No fight, no leaders, no confidence and no quality. We’ve done well to stay in the Premier League for so long given the size of our club and the quick progression but it looks like this is our worst team for quite some time. Extremely worried. I just think it’s been a mess since getting rid of Jol. Putting a manager in with no experience then surrounding him with experienced yet not exactly fantastic help in Wilkins and Curbishley undermines him. Cardiff aren’t going down with OGS (the nicest man in football) at the helm! We’ll be fine if we can rediscover our brilliant home form. I’m confident. Bluebirds! I am not as confident as you, I think you’ll lose against Swansea. If you beat them it could give the team enough confidence to get a run together but I am highly skeptical. My three; Norwich, Cardiff, Palace. I’ve got £50 on Fulham to stay up!